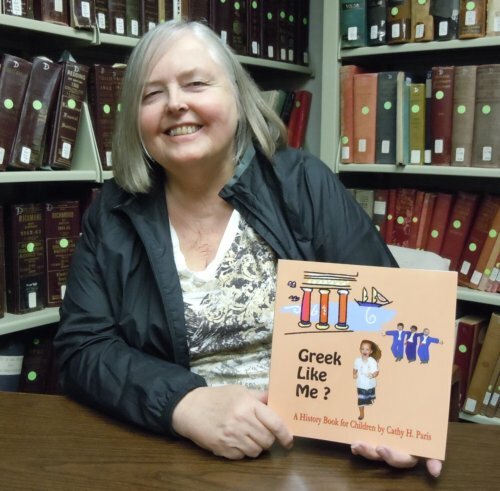 When Cathy Paris brought her new book Greek Like Me into the library everyone gathered around to marvel at her creativity. Cathy wrote the book so her children and grandchildren could learn about their Greek heritage and their roots in the Greek village of Koroni. One of Cathy's acknowledgments is to her father-in-law for "enduring my relentless questions about his life in Koróni." From his recollections as a young boy, Cathy tells the story of his grandparents, Pavlos Psaropoulas and Irini. She describes how the events of history impacted the lives of the citizens of Koroni, especially the family of Pavlos and Irini. 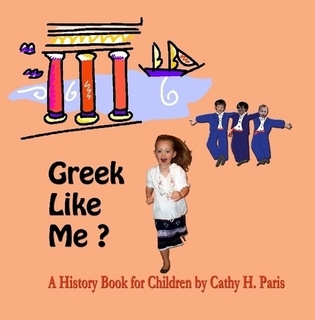 Greek Like Me is a seventy-nine page illustrated children's book with an overview of Greek history from ancient times until the 1930s. The book is filled with colorful images in which Cathy has magically added photographs of her grandchildren. I can only imagine their delight in seeing themselves inserted into the pages of their family history. Greek Like Me was published on Lulu.com. She has also published a private version of the book for family only. Photograph by Kathryn M. Doyle, 5/3/2011, Oakland, California. How cute is that?! So glad to see more genealogy offerings for young people these days. Congrats to Cathy! Writing for children is so much fun, and with all the positive feedback, I am energized to do my next project. Thank you for your encouragement.